What Does It Mean to be Certified, Licensed, or Accredited in the Drug and Alcohol Treatment Industry? In the documentary film, The Business of Recovery, the US drug and alcohol treatment industry is described as “The Wild, Wild, West” and highlights the following information. The industry is highly unregulated. There is no mandatory national certification – 14 states do not require a GED (General Education Diploma) or industry exam to be a certified counselor. Sober Living homes have little or no zoning requirements nor are they required to have any kind of certification, license, or background check. At the same time, we are in the middle of an opioid epidemic with 175 people dying every day from an overdose. Overdose is now the #1 killer for Americans under the age of 50. So where do you turn when you are trying to find treatment and in the middle of a crisis? Over 60% of people needing help turn to the Internet. There you will find over 14,500 addiction treatment center options. However, less than 5000 are accredited. What exactly does that mean and where do you start? · There is not a standard glossary of treatment terms. Sober Living is sometimes referred to as Residential Care. · There isn’t any enforcement of accurate information for advertising. · States vary with their requirements for addiction treatment facilities. For example, in California, you can operate an outpatient treatment center without certification or a license. Residential centers are required to be licensed, but do not have to be accredited. This makes looking at a treatment center’s website confusing. At a time of crisis, looking for help should be factual and straightforward, but often it isn’t. 1) Is the center licensed or certified? It never hurts to check with your State’s Department of Health to see what its requirements are for treatment centers. Especially, if you are looking for residential treatment, residential centers are required to be licensed by the state. Surprisingly, some residential rehab facilities operate without a license. 2) Is the center accredited? There are a few accreditation organizations that are federally recognized – CARF (Commission on Accreditation of Rehabilitation Facilities), Joint Commission, and COA (Council on Accreditation). 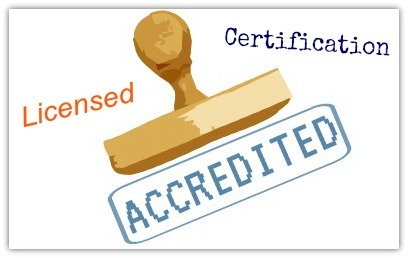 Being accredited means that a center has to comply with standards and be routinely evaluated from that organization. It does not mean that treatment will always work, but it does help ensure that you or your loved one will be safe while in treatment and specific protocols will be followed. Always ask questions. Call the centers directly. Take tours of the centers you are considering and ask to meet with counselors and program directors. While you are there, ask to see copies of their license and accreditation paperwork. Overall, there are high quality addiction treatment centers that care, are licensed, accredited and will go the extra mile to help you or your loved one get the right treatment. Ultimately, people need to feel connected – know that they are not alone. There is always hope. This may be the first step on your new path for self-care. Be encouraged to take a deep breath and be prepared to ask questions. It is your right. Missy Held co-founded Breakfreely.com out of a passion to change the drug and alcohol treatment industry. BreakFreely.com is an online tool to help people find licensed and accredited rehab centers. There are no ads or sponsors. In an industry that is mostly unregulated and plagued with deceptive marketing practices, she wants to bring clarity and factual information to those in crisis. She also seeks to highlight stories of hope and positivity. She believes mental health is critical to one's overall well-being.